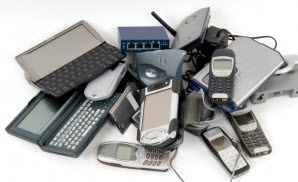 If you’re like many people this time of year who are cleaning out or following the new “simplify” craze, you’ve come across a drawer filled with old cell phones and devices. Don’t throw these devices in the trash–they’re bad for the environment. They can be put to good use, whether by yourself or someone else! Just make sure you reset the device settings to the factory settings. If you’re not sure how, DealNews has a guide to help you with that. Now let’s see what we can do with these unused gadgets! Recycling could be the easiest thing for you. Get all of the devices in a box, and either call your local waste management to see where you can drop them off, or go to the Sustainable Electronics website, and click your area on the interactive map, and it shows you where you can send or drop off your items. American Cell Phone Drive is an organization that helps raise funds for thousands of organizations worldwide. Follow the link, type in your zip code, and it will direct you to local places that will gladly accept your old cell phones. Many large electronics retailers, online and brick-and-mortar, will accept your outdated gadgets for recycling, as well as the device manufacturers. In some cases, they will purchase newer items (usually less than three years old) and put the amount on the retailer’s gift card. A quick search online will help with finding what stores will buy from you. Organizations such as domestic violence centers, daycares, schools and veterans’ associations are just a few places that may take the donation where it can be used for education or for emergencies. Call and speak with whoever is in charge to find out if they can use what you cannot. You can always sell your devices, the newer the better, and put a bit of cash in your pocket, or donate the proceeds. Social media is full of local “yard sale” pages where you can post items for free or use an online auction site to sell your goods for a fee. A laptop or computer tower takes a little more work to erase all sensitive information from, but these can be donated or recycled as well. If the computer still works, call a local school, senior center, homeless shelter or youth program to see if they can use it. Many will gladly take a free computer. Do an online search to see if any local retailers or recycle centers will accept your laptop or computer, and when you call, make sure they can recycle laptop batteries, too. In some cases, the lithium-ion batteries must be recycled separately. Despite decades of recycling programs, many Americans are still doing it wrong. Many things that can’t be recycled are tossed in the bins, and with changes in the way plastics are manufactured now, we need to make sure what we think we’re recycling can be used. Let’s look at ways we can improve what and how we’re recycling. Rinsing any type of food containers–plastic, steel, and glass–is a good idea, but not all municipalities require it. Check with your local waste management office about rinsing, or not to rinse. Plastic bottles of all kinds and their lids can be tossed together. Manufacturers are now using recyclable materials for the tops. Keep plastic shopping bags in a bag of their own, and take them back to the store they came from for recycling. Don’t throw them in the recycle bin. Cardboard food delivery boxes, namely pizza boxes, can be recycled in many areas, but make sure they’ll take the greasy bottoms. If not, tear off the lid and toss it in the bin! We don’t always think about toilet paper and paper towel tubes, so add those to your recyclables pile. According to Waste-free Mail’s website, Americans use an average of 700 pounds of paper products per person, per year. Almost all paper products are recyclable, so check with your waste management about what they collect. Don’t throw that package wrapper in the garbage! Check out what’s recyclable by using this guide from plasticfilmrecycling.org. Many bathroom items get overlooked in the recycling game. Bottles for bathing products, deodorant containers, and empty medicine bottles are all perfectly recyclable. Milk and juice cartons are recyclable! Many of them end up in landfills because it’s believed they are coated in wax. Unfortunately, your disposable coffee cup should be just that–disposed of. They are coated on the inside with polyethylene, making them non-recyclable. If you’re in doubt about an item, find out if it’s okay before you put it in your bin. “Contamination” items can bring the machinery to a halt in the sorting process, costing time and money. After getting the correct information from your area’s waste management program about what you can and can’t recycle, check to see if other things can be dropped off at a local center. Find one near you by typing in your zip code at iwanttoberecycled.org. Not only do we need to recycle, we need to buy recycled to complete the circle. Besides helping improve our environment, when we buy products or packaging made from recycled products, we encourage manufacturers to start using more recycled materials, and that’s what recycling is all about.